How do I post / sell my property on the site ? How to I add images/pictures to my ad? How do I find the geo data for my ad? Can I sell/rent my property through you? For how long will my ad be displayed? How do I edit/delete my property ? What are the rules and regulations for buying property in Sri Lanka for foreigners and expats ? Is there a VAT for apartments ? How far should my house be from the coastline under new government legislation? How do I add my profile picture ? 2) Once registered you will have 4 buttons to select. Please click on the ‘Add a new Ad' button. 4) You can enter the details of your ad at this stage and press the SUBMIT button at the bottom of the page to proceed. 5) You will now be presented with two options – whether to finish posting the ad (without pictures) or add pictures. Kindly select the appropriate option by clicking on the button. If you selected to ‘Finish Posting' then you have completed posting your ad and your ad will be available immediately on our site. If you selected to upload images, then you simply need to select the images and press the UPLOAD button. After this your pictures will be uploaded and your ad posting process will be completed. For more help with uploading pictures please visit our image upload guide. Click here to register and get started with posting your ad. Please visit our image upload guide. You can post up to 1 ad free of charge (for certain property types). If you wish to post more ads, then please Contact Us to discuss about the different Membership options available. We do not charge any fees, commission, referral fees or anything like that from a successful sale or lease. You can optionally upgrade/promote an ad to guarantee placement on the first page or home page for a small fee. Please see below about upgraded ads. Upgraded ads allow you to promote your ad to be placed permanently above other ads of the relevant category for a period of 30 days. To upgrade an ad, please login and click on the 'View / Edit / Del ads' option, then click the 'Upgrade' button next to the ad you wish to upgrade. By upgrading your ad to a Showcase, Platinum or Featured status you can get higher visibility for your ad (up to 3000% more) and thus ensuring more leads. There is only a limited number of places available for Showcase and Platinum ads and when all places have been taken you will need to wait until one becomes available. We will show when the next slot will be available if the current holder does not renew their ad. Each upgraded ad will be valid for 30 days. You will need to renew the upgrade if you need to extend beyond 30 days. You will be able to renew the ad 5 days before the upgrade expires. Once the upgrade expires the slot will be available for anyone to use and if all the slots have been taken you will need to wait until one becomes available again. Your ad will be displayed, as currently, only on relevant results. Eg. if the ad was for a Colombo apartment sale, it will appear under all Colombo listings however will not appear under Dehiwala listings. If you upgrade to a status other than Platinum you will be able to upgrade to a higher status at anytime during the upgrade valid period (subject to availability). However you will need to pay the full price of the new upgrade status and will not get a refund for the remainder of your existing status. To start Upgrading your ads, please visit the ad listing page. 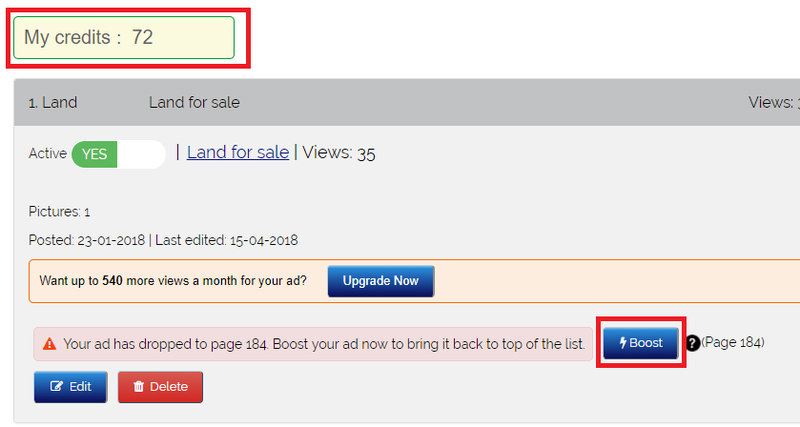 Boosting allows you to move your ad to the top of it's listing category immediately after the ad is boosted. The ad will then remain in that position until other ads are Boosted after that, which will cause the ad to move down. You are free to use the Boosts whenever you want to, as long as you have sufficient credit to use for Boosts. An ad that has not been upgraded will be visible immediately below the upgraded ads once Boosted. How do I buy Credits to Boost my ad? 1) Once logged in, go to 'View / Edit / Del ads'. On top you will see the number of Credits that you have. 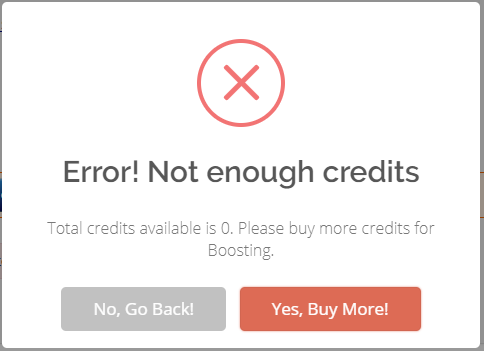 If you don't have any, you can click the 'Boost' button below to purchase credits. 2) Click on the 'Yes, Buy more' button and select the amount of credit you need to buy, followed by payment by card or bank transfer. 3) If paid by card your Credit will be added immediately and you can then go back to the listing and click on the 'Boost' button shown above to boost the ad. To start Boosting your ads, please visit the ad listing page. You can contact us via our Contact Us form by clicking here. You can view all ads that you have posted by logging in to the My Account section. You simply login to your account area and click on the View/Edit/Delete button and then on the EDIT button next to the relevant property. Please go to the Lost Password form and enter your email address in. Your new password will be then sent to this email address. 2) Select your location using the zoom and navigation buttons (on top left of map) and your mouse and once you have found it, click on your location. The Latitudes and Longitudes will be shown on the map itself and also on the right side. Copy that information into the appropriate boxes when adding/editing your ad. For a closer zoom, use a zoom value of 16. Use 8-12 for a general zoom. You may advertise your property on the website. We are not estate agents so we will not handle any aspect of the buying and selling process. we merely list the ads. I am an Estate Agent/Broker. Can I post my property on your site and is it free for agents? Your ad will be displayed for 90 days. If you wish to have the ad active beyond 90 days you can login and edit your ad (no changes required) before 90 days. This will give you a further 90 days. Estate agent listings will be displayed indefinitely. LankaPropertyWeb.com reserves the right to remove any ad at any time which contravenes to its Terms and Conditions. Is there VAT on apartment sales ? If you haven't got an email with the activation link, you can either request to re-send the email by clicking here or re-register with another email address. If you are having difficulty with the activation link please try to copy and paste the entire link (starting with the http://) on to the browser and press Enter Key, or contact us via the Contact Us form and we will be able to assist you. Once logged in, click on the 'Change your Email, PWD & Profile' button. Here you'll be able to upload your profile picture, which will be displayed on your ads. As part of LankaPropertyWeb.com’s acquisition of Lamudi.lk, we have migrated your ad from Lamudi over to LankaPropertyWeb.com and house.lk, Sri Lanka’s #1 and #2 property websites. You will be able to make payment, upgrade the ad or purchase Boosts from this page. If you have any issue or questions, please feel free to contact us on contactus@lankapropertyweb.com or call us/Whatsapp on 076 740 0909.